In his book The Partnership: The Making of Goldman Sachs (Penguin Press, 2008), Charles D. Ellis (MBA ’63) explores the growth of Wall Street’s most celebrated firm, from its humble origins in 1869 as a dealer in commercial paper to what Ellis describes as a “global juggernaut.” While much has changed for Goldman and other investment firms in the last year, its rise to prominence — driven by extraordinary individuals — is a matter of record. The following excerpts from The Partnership look at two of its greatest leaders, Sidney J. Weinberg and John C. Whitehead (MBA 11/ ’47), and the impact they had both on Goldman and Wall Street itself. Having tasted politics in 1932 by working for Franklin D. Roosevelt as a member of the Democratic Party’s National Campaign Finance Committee, where he raised more money than any other member, Weinberg launched a long series of relationships with occupants of the White House that would continue for more than thirty-five years. Almost everybody on Wall Street voted against FDR, and many distrusted him or literally hated him. For Weinberg this was an opportunity to go the other way and reach out to be helpful to the president, and he took it. In 1933 the president had him organizing the Business Advisory and Planning Council, through which corporate executives could present their views to the government with an assured hearing. And suddenly, there he was — a Jew from a Jewish firm of no great stature on Wall Street — extending as valuable an invitation as a business executive could have: to be one of the corporate executives who would meet with the top people in government and speak on behalf of the American business community. 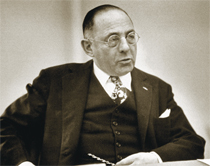 The council became the bridge between business and government during the New Deal, helping coordinate business and government relations, clearing up misunderstandings, and restoring confidence....With an engaging personality and a great gift for gab, [Weinberg] was a star of the show and was soon known to everybody. He knew exactly how to capitalize on all these contacts. With his subsequent War Production Board service, he soon became the number one go-to man between corporate America and the U.S. government. Affectionately called “the body snatcher” by FDR because his CEO meetings proved so very effective, Weinberg rapidly accumulated an extraordinary advantage for an investment banker: He got to know large numbers of America’s best young executives and to see firsthand how effective each one really was, what work he was best at, and with whom he worked particularly well. After the war, hundreds of these same executives went back to run their companies, and many decided to make Sidney Weinberg their investment banker….He became a high-volume, high-level matchmaker who was discreet, got things done quietly and effectively, and was remarkably successful. More than anything else, the power and stature Weinberg accumulated during the war years — plus his remarkable one-to-one relationships with America’s top executive talent and his encyclopedic knowledge of the skills and personalities of many top executives — boosted the stature of Sidney Weinberg. Whitehead’s memorandum advocated a complete change in the firm’s organizational structure — a change that would, in time, decisively accelerate Goldman Sachs’s becoming the nation’s and then the world’s preeminent investment bank, and in time would cause every major competitor in the investment banking industry to restructure too…. At Goldman Sachs, Sidney Weinberg had been succeeding greatly within the old, established structure. In his irreverently unique way, he had become a master of that traditional structure, and it had enabled him to become accepted as an effective, powerful leader. So why would he be open to making any change, let alone endorsing major change? Into this unpromising environment, Whitehead proposed to separate executions from solicitations and to have everyone in investment banking at Goldman Sachs work either on soliciting business and managing relationships or on executing specific transactions. Nobody would do both, even though that was the way it had always been done on Wall Street. The idea of soliciting business with a team of people who did nothing else was entirely new and different for investment bankers. It was distasteful to many — including Sidney Weinberg, who knew how important he was — and to many it seemed a sure waste of money because it could not possibly be effective. Who, after all, could compete with Sidney Weinberg or with any of the other leading bankers at Wall Street’s leading firms, who as professionals all took pride in delivering the services they sold and sold only the services they themselves delivered? Everyone knew that all investment banking business had always been done at the highest executive levels and could only be handled by skilled and experienced partners. Weinberg naturally believed he had unique skills and abilities to develop relationships — skills and capabilities that were not about to be matched by a mere commercial-paper salesman. Like other traditional investment bankers, Weinberg believed that only the banker who would actually execute the transaction could possibly fully understand what to promise or propose, and he saw soliciting other firms’ clients as unprofessional. Sidney Weinberg would see no merit in making any change…. For Whitehead, there were two important dimensions to the problem with Wall Street’s traditional practice of just one investment banker doing it all for his client. First, sales and selling were not demeaning; they were the vital strengths of a great organization and should be so recognized. It takes time and thoughtful attention to each client organization to become an expert on the opportunities and problems that particular client must deal with successfully; to understand how those problems and opportunities are changing and might change as time passes and circumstances develop; to keep all the relevant people at each client fully informed about and confident in the firm’s special ability to serve effectively; and to make them confident and comfortable that the firm to use for each major transaction is, naturally, Goldman Sachs. Second, selling should be separated from manufacturing to be sure the best manufacturing skills are dedicated to making the best product. Producing the best-manufactured product is key to delivering the best service, and there are just too many specialized products in investment banking for anyone to be a true master of each and all of them. Weinberg briefly expressed offhand skepticism in the meeting and was clearly not supportive. “He rather obviously ignored the whole idea,” recalls Whitehead, “but it was important that he did not explicitly reject the idea either.” No formal vote was taken. With no direct opposition, Whitehead boldly and quietly decided to act. “Since there was no vote,” he explains, “we had not voted no. So I just went ahead.” Weinberg never did endorse Whitehead’s concept. 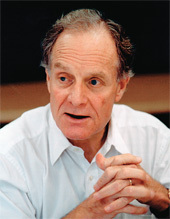 Charley Ellis was managing partner of Greenwich Associates for thirty years, in which capacity, as a strategy consultant, he worked closely with Goldman Sachs’s leaders and top executives. He is also the author of fourteen books, including Winning the Loser’s Game, Joe Wilson and the Creation of Xerox, and Capital. An updated paperback edition of The Partnership will be available this fall. In addition to writing, consulting, and board activities, Ellis is managing partner of Partners of ’63, a group of his HBS classmates that supports social enterprise and nonprofit organizations.